We all seem to know that one person who is completely petrified of the dentist. If you’re that person, then this can apply to you as well. 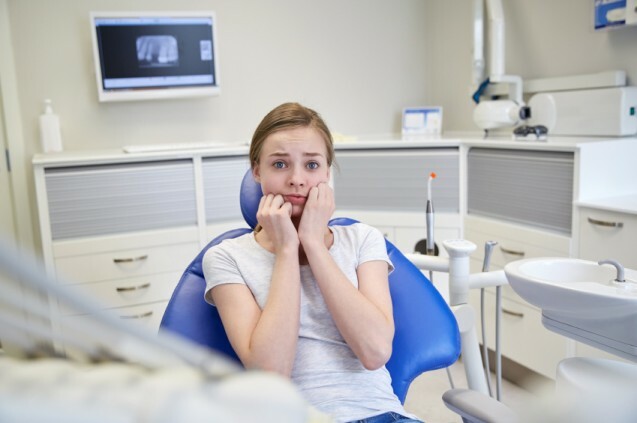 Here are some simple tips and tricks to get you over dental phobia! Bring a friend to that very first dental appointment. Make sure it is someone you trust, who makes you feel safe. Bring your own headphones and plug them into your phone and listen to your own music. By doing this it drowns out the sound of tools or anything else while your teeth are being worked on. Taking controlled deep breathes in and out help a lot. It keeps your heart rate slow and keeps you from panicking. A great thing to have because while you are getting your teeth worked on you can zone out and picture yourself a thousand miles away. You will be done before you even realize it. This means keep your eyes closed when you’re being worked on. This helps your brain focus on something else such as the music you are listening to, or what plans you may have for after the dentist. Most dentist’s office now put a T.V. on in front of you while they are working on your teeth. Ask them before they start if you can put it on the channel you like (if you have no music) this will give your brain yet another place to focus on during treatment. It is no secret how terrifying a trip to the dentist can be. With these tips at your disposal, your next visit should be a piece of cake. When it doubt just tell your dentist you are afraid. It will make a difference if he or she is aware of your phobia.